↑ ୧.୦ ୧.୧ ୧.୨ The Reptile Database. www.reptile-database.org. ↑ ୮.୦ ୮.୧ ୮.୨ J.E. Carrington Turner (1959). Maneaters & Memories. Dehra Dun: Natraj Publishers. David, P., and I. Das. 2004. On the grammar of the gender of Ptyas Fitzinger, 1843 (Serpentes: Colubridae). Hamaddryad 28 (1 & 2): 113-116. Lazell, J.D. 1998. 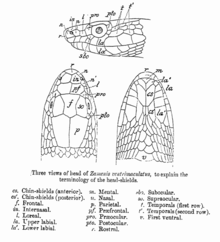 Morphology and the status of the snake genus Ptyas. Herpetological Review 29 (3): 134. Nixon, A.M.A., and S. Bhupathy. 2001. Notes on the occurrence of Dhaman (Ptyas mucosus) in the higher altitudes of Nilgiris, Western Ghats. Cobra (44): 30-31.